Drostanolone Enanthate 200mg/ml We sell unfiltered Drostanolone Enanthate 200mg/ml oil, you need to use 0.22 um sterile syringe filter or disposable filter to finish filteration, then dispense into 10ml sterile vial. Then it’s ready to use or sell. We can also customize pre-mixed injection according to your need. Drostanolone Enanthate Description Masteron Enanthate (Drostanolone Enanthate) is a dihydrotestosterone (DHT) based anabolic steroid. Drostanolone is simply the DHT hormone structurally altered. The alteration exists through the addition of a methyl group at carbon position 2. This ensures the hormone doesn’t suffer metabolic breakdown brought on by the 3-hydroxysteroid dehydrogenase enzyme found in the skeletal muscle. This simple structural change also makes the hormone far more anabolic, and that gives us Drostanolone. Once the hormone has been created, altered from DHT, an ester is then attached, and in this case the ester attached is Enanthate. Enanthate is not a steroid or a drug but nothing more than a timing tool used for a drug. 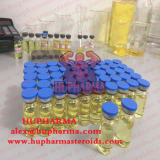 As with Masteron Propionate, Masteron Enanthate is well known for being one of the only anabolic steroids that carries strong anti-estrogenic properties. This anabolic steroid cannot increase estrogen levels; in fact, it can actually decrease estrogen levels in the body. It is for this reason Drostanolone was successful in breast cancer treatment with the combination of Drostanolone and Tamoxifen being very commonplace for many years. Bodybuilders welcome this trait due to estrogen often being difficult to control with many steroids and lower estrogen levels often leading to a harder and more defined look during the cutting phase. Masteron Enanthate possesses some of the most misleading anabolic and androgenic ratings of any anabolic steroid, although not nearly as misleading as Halotestin and Anavar. Drostanolone has a binding affinity to the androgen receptor that is five times greater than testosterone, which not only produces a harder look it can also have a positive impact on fat loss. All anabolic steroids can help improve the metabolic rate, but those with a strong androgen binding affinity can have an impact on direct lipolysis.